Popular book resonates with women nationwide. There is power in the female conversation. Tap into a woman’s raw struggle, breathe hope into her hopelessness, and she will tell everyone in her sphere of influence. 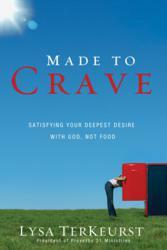 Made to Crave: Satisfying Your Deepest Desire with God, Not Food (Zondervan) by Lysa TerKeurst, president of Proverbs 31 Ministries, made several national bestseller lists this month: the New York Times bestseller list for three consecutive weeks, hitting #7 on the paperback Advice list for the week of February 6, 2011; the USA Today bestseller list at #136; and #9 on the ECPA paperback bestseller list for the month of February. Promotions for Made to Crave include the Craving God Challenge (a weekly email devotional centered on the book), a national blog tour, major radio promotion on the KLOVE radio network and KSBJ-FM, as well as a national publicity campaign. TerKeurst is also leading live webcasts every Monday for six weeks, ending on February 14, at http://www.madetocrave.org. The webcasts are averaging more than 23,000 streams each week. Made to Crave is the missing link between a woman’s desire to be healthy and the spiritual empowerment necessary to make that happen. The reality is that people were made to crave. Craving isn’t a bad thing. But we must realize that God created us to crave him. Many of us have misplaced that craving by overindulging in physical pleasures instead of lasting spiritual satisfaction. The Made to Crave book, the DVD curriculum and the participant’s guides are available at all retail outlets. For more information on Made to Crave, please contact Karen Campbell at 616-309-4390 or at karen@karencampbellmedia.com. Zondervan is the world’s leading Christian publisher of books whose authors are noted for their excellence in the craft of writing as well as their worthy contribution to the ongoing global evangelical conversation. The works published by Zondervan not only confirm readers’ faith and understanding, they also challenge and stretch readers’ thinking. For more than 75 years, Zondervan has delivered transformational Christian experiences through general, ministry and academic resources by influential leaders and emerging voices, and has been honored with more Christian Book Awards than any other publisher. Headquartered in Grand Rapids, Mich., Zondervan publishes bestselling books, audio, video, curriculum, software and digital products in such categories as biblical languages and studies, biography, business, contemporary issues, counseling, cultural, devotional, evangelism, family, fiction, history, inspiration, leadership, ministry, pastoral, personal development, prayer, philosophy, reference, relationships, textbooks, theology, youth and more. Zondervan resources are sold worldwide through retail stores, online and by Zondervan ChurchSource, and are translated into nearly 200 languages in more than 60 countries. Visit Zondervan Books on the Internet at http://www.zondervan.com/books.